Why is Thai cuisine so popular? 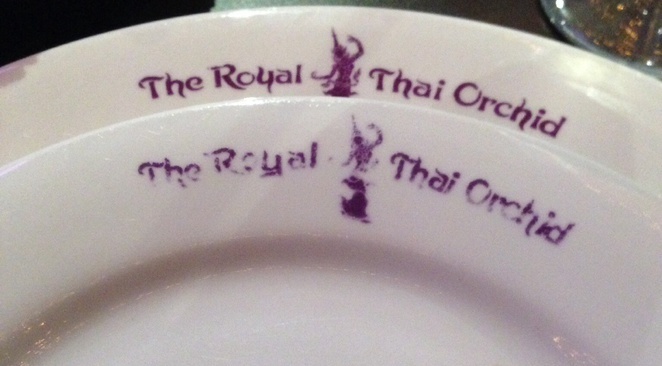 The Thai Orchid Restaurant claims to have been the first Thai restaurant to open up in Brisbane back in 1986. To still be up and operating as a Thai Restaurant, they obviously have been doing something right. Thai cuisine remains a popular choice among Australians. We do tend to like our Asian food. This is evident by the number of different Thai, Chinese, Indian, Vietnamese and Malaysian restaurant in every suburb. But I always ask, what makes a good restaurant and how do you choose which one to dine at? 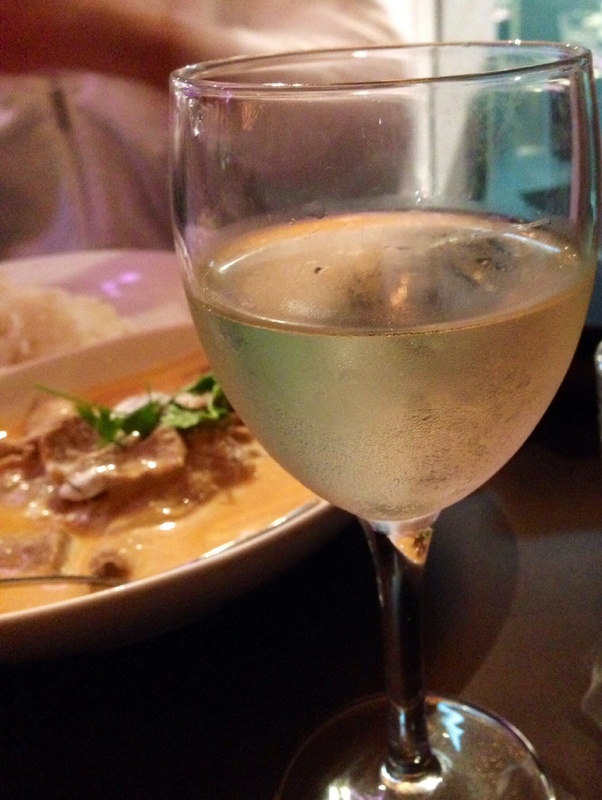 My husband loves Thai food, so when he chooses where to eat, we normally end up at a Thai restaurant. I love the Thai dishes that are overloaded with fresh vegetables and my husband loves curries of any sort. 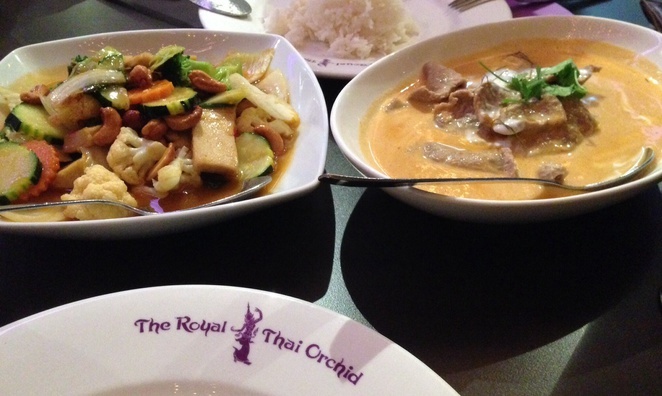 Last week we were in the Springwood neighbourhood and chose to dine at the Thai Orchid. One of the reasons was that on their website, they described their Thai cuisine as having won multiple awards. The restaurant itself was extremely neat, clean and very much Thai inspired. The decor was quite elegant and the atmosphere very welcoming. The staff were very accommodating and very friendly as most Asian people are. They always seem very welcoming when food is involved and here at the Thai Orchid they were very happy to serve you their food. And yes, now to the food. 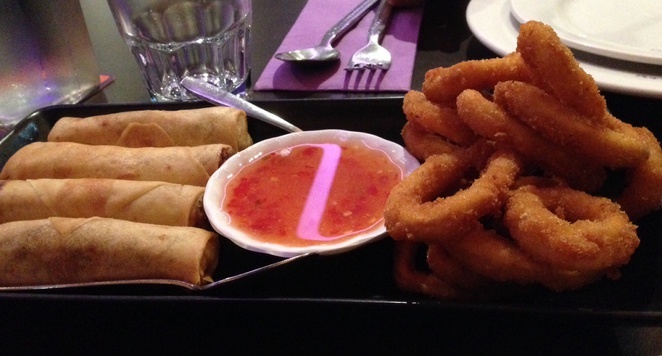 We ordered fried crumbed calamari (my husband's choice) and duck spring rolls for entree. The calamari was a little disappointing as it had a little too much battered crumb on it for our liking, but still very edible. The duck spring rolls were quite tasty and different. For our main meals, we enjoyed Pad Pak Med Mamuang -a vegetarian stir fry with tofu, chilli and cashew nuts and a massaman beef curry. Again we found the food a little hit and miss. The vegetarian stir fry was wonderful and loaded with fresh vegetables and flavour so I was happy, but the curry even though the flavour was there, it contained only beef with minimal vegetables. So our verdict was that the food was good but not the best Thai food we have eaten. Still the restaurant was very busy with customers both dining in and coming to pick up takeaway orders, so obviously it is a popular choice. I think like us in order to make up your own mind, you would have to dine here and it is worth finding one of the many Thai Orchid restaurants dotted around Brisbane. The restaurant is fully licensed, with BYO wine only. They also cater for larger groups and on the menu have several different choices for banquet dining. The prices are quite reasonable and the size of the dishes are quite generous with the option of a take home box, if you have had your fill. I believe that Thai cuisine will continue to remain popular as there are many dishes and flavours to choose from. So we will continue our little mission to seek out those restaurants which serve high quality food with high quality service.